"Menotti is a sensationalist in the old style, and in fact a weak one, diluting the faults of Strauss and Puccini with none of their fugitive virtues" Thus decreed Joseph Kerman in his highly influential 1956 book, �Opera as Drama�. Kerman had, in fact, singled out The Saint of Bleeker Street for particularly severe criticism, and Menotti�s reputation never fully recovered. From his high point in the 1940s, when it seemed he could do no wrong, Menotti in the �50s seemed uncomfortably wedged between the extreme avant-garde-ism of Cage and his disciples, and the explosive Broadway shows of Bernstein and others. His style is often referred to as something between Puccini and Hollywood, and that needn�t be disparaging. Now that we can view artistic trends with a cool post-modernity, what Menotti was trying to say can perhaps be appreciated with something like rational objectivity � after all, Kerman had also famously lambasted Tosca as "a shabby little shocker". Not that it�s terribly easy to be too kind about Menotti�s libretti, which (like Tippett�s) are his own, and often get the worst flak. This particular opera has a story more difficult to take seriously than other of his stage works, the best of which are imaginative flights of fancy, or political allegories. This one clearly reflects the composer�s own struggle with his faith. It takes place in the squalid tenements of New York�s Little Italy, and centres around the supposed miraculous visions of a young girl, and her eventual death in a state of ecstatic bliss. Throw into the mix her low-life, sceptical brother, an assortment of colourful street characters, religious street processions and basement restaurants, and you could say we are in a kind of verismo operatic Goodfellas. Well, not quite, and it�s a measure of the strength of Menotti�s music that it alone largely saves the day. 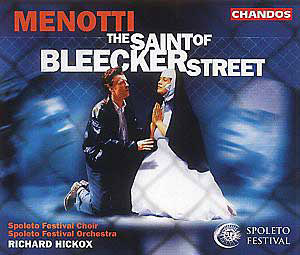 The present recording is based, like most of Chandos�s ongoing Menotti series, on performances at the Festival of Two Worlds in Spoleto, the annual arts festival founded by the composer in 1958, and still regarded as one of the highlights of the cultural year. This means that the cast and orchestra are very well drilled by the current artistic director, Richard Hickox, who clearly believes passionately in the piece. There is an emotional intensity that never descends into bathos, and the high points have a power that, in lesser hands, could easily have become cheap, B-movie sentimentality. The musical language is always tonal, and the orchestration redolent of the great Italian operatic tradition that must have been in the composer�s blood. The end result is something which should really find a willing audience, with many good tunes, a sumptuously rich instrumental palette, and plenty of emotional clout. This recording can do the composer�s cause no harm at all. The singing does vary slightly, but it has to be said that many of the cast are relatively young and inexperienced � in fact, it was always one of Menotti�s aims that this festival should help young American and European artists to appear in world-class productions. Carrying the brunt of the emotional weight is Julia Melinek as Anina, a difficult part to bring off both vocally and as a characterization. She acts convincingly, but the voice does begin to show stress in places, with a wide vibrato beat becoming apparent at big climactic points. For the most part though, she is more than up to the part; try the big Act One aria �Ah, sweet Jesus, spare me this agony�, where one is left in no doubt as to her inner turmoil. As her troubled brother Michele, Timothy Richards sings well enough but struggles with an unnecessary accent � he would have been better advised by the director to leave it out altogether and just sing, rather than draw attention to the problem. All the other main characters obviously relish their strong roles, and the chorus are exemplary; try the wedding scene at the start of Act Two, where the homage to Leoncavallo and Puccini seems at its strongest. Menotti (or Mr. MacNotti, as he�s affectionately known in his Scottish highland retreat) has long since given up caring what critics make of his work. At a recent New York gala, given to celebrate the fiftieth anniversary of his most popular opera Amahl and the Night Visitors, he remarked "I don�t write operas any more, because I�m not bothered by anything now. I�m not angry about anything. I�ve not solved the problems of my faith or the Church. The question marks are still there, but they don�t bother me that much". He also took a typically realistic view on how posterity would judge his work, particularly The Saint, "A composer can only be right after his death. Only the future will say who is right or wrong�I have a suspicion that [The Saint] will survive me and my critics." Given the general excellence of this Chandos set, with clear, well-balanced recording, full text and informative booklet, he could well be absolutely right.